Hulk (2003): This is one of the few superhero movies made where casting is perfect! Everybody looks like they're supposed to or are at least reasonable facsimiles. Eric Bana looks just like Bruce Banner, Jennifer Connelly looks just like Betty Ross, and Sam Elliott darn sure looks like General "Thunderbolt" Ross. There is one thing about the Hulk character that threw a lot of people for a loop: his size. In the comics, the Hulk is generally seven to eight feet tall. In this movie, the Hulk is about twenty feet tall. Wow! I actually liked that he was this big. It seemed more real that he could smash tanks, jump onto jets, fight monster dogs and such when he's this size. The computer effects are amazing. You can actually lose yourself and think that the Hulk was a real being; he didn't look computer generated. This movie is over two hours long and for the first hour they're setting up the Hulk's origin. It does kind of drag at the beginning, but it is important for people unfamiliar with the Hulk to know his story. 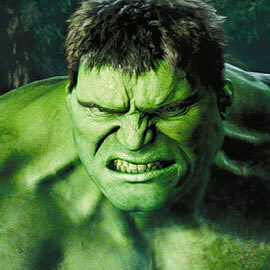 His origin is changed somewhat from the comic books, but follows the same principle: Bruce Banner is exposed to radiation and becomes the Hulk when he gets angry. And once he becomes the Hulk, the movie is non-stop action and suspense all the way to the end. Nick Nolte plays Bruce's mad scientist father David and does a remarkable job. I'm a big Nick Nolte fan anyway, but he does add a lot to this movie. This movie is a must-see, especially if you're any kind of fan of the comic book Hulk. The action WILL impress you.